If you are looking for a meaningful and absolutely adorable baby gift, then look no further! 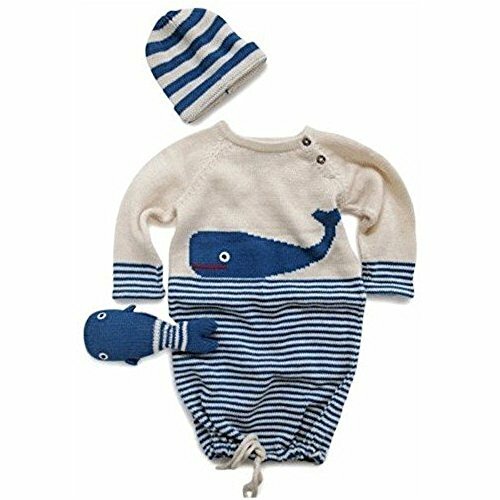 This unique gift set features a gorgeous whale baby gown, plush rattle toy, and matching striped hat for a complete package that baby is sure to love. Each item is hand knit from 100% organic cotton, making it super safe, soft and cozy! Such a wonderful eco-friendly gift for baby! Features: Hand knit baby gown made from 100% organic cotton Hand knit whale rattle made from organic cotton and polyester stuffing Hand knit blue striped baby hat made from organic cotton Measurements Gown - fits babies 0-6 months Rattle - 4" x 2" Hat - fits babies 0-6 months Made in Peru GOTS certified Just Cause Gift Our Green House is committed to saving whales which is why we have created our own line of Just Cause gifts. Wherever you see our Just Cause symbol you will know that a portion of the proceeds goes to help endangered or at risk species, like the Blue Whale. For our full line of Just Cause products check out our Gifts category and see how you can help today!